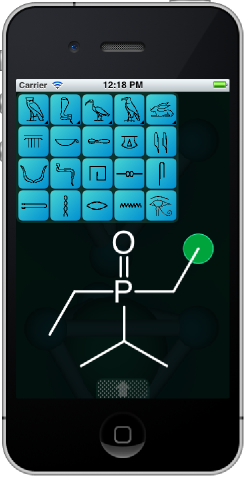 The Mobile Molecular DataSheet, and other mobile apps, will soon have an icon makeover. Implementing a publication-quality molecular drawing user interface for all sizes of mobile device, from the palm-sized iPhone to the page-sized iPad, is no simple task: there are many aspects of functionality, and the screen only has enough room to represent all of the options with iconic glyphs. 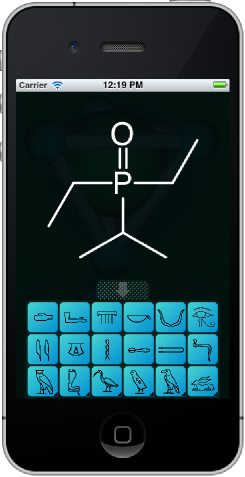 Because there are so many components to drawing chemical structures, there are correspondingly a lot of icons. This preponderance of icons has caused some issues with the usability of the MMDS sketcher, so in order to lower the learning curve so that anyone can get started quickly and easily, and be drawing structures right away, the icon set has been redesigned by a user interface expert. As can be seen in the screen capture on the right, the main menu for the sketcher component how makes the chemical drawing functionality more intuitive and clearer than ever. Using the same icon set from other action menu-banks, the list of functionality that can be applied to the current molecular object is immediately obvious. These breakthrough new changes will be applied to MMDS first, and then one by one, each of the apps that share the same technology will be updated.